A friend from the military chapter of my life asked if I would republish a story that first ran on Memorial Day weekend five years ago. We present this with pleasure in recalling an extraordinary man and with renewed sadness at his loss. There is someone I think of every Memorial Day, and many other days. Cornelius Ram and I were among a collection of young men who accepted the United States Marine Corps’ bet that we weren’t tough enough or smart enough to wrestle commissions from the Corps. It quickly became apparent to everyone, including the drill instructors charged with pounding us into the shapes of Marines, that Corky Ram would have no problem. He was a standout in the grueling weeks of officer candidate competition and then in the months of physical and mental rigor designed to make us worthy of those little gold bars on the collars of our fatigues. After high school in Jersey City, New Jersey, he had served a hitch as a Navy enlisted man, and then got a college degree before he chose the Corps. He was two or three years older than most of us, and a natural leader. He could tell when the pressure was about to cave a green lieutenant exhausted from a 20-mile forced march with full field pack or demoralized after a classroom test he was sure he had flunked. Corky knew how to use encouragement or cajolery to restore flagging determination. He helped a lot of us make it through. The picture above is how I remember him from that period. There’s a bit more to the story. Major Ram, Executive Officer of 2/5 Marines, and Captain Ford (of Glen Rock, NJ), Commanding Officer of Echo Company, were overhead in a command helicopter when they spotted the wounded Marines in the open and in the path of oncoming enemy troops. The helicopter pilot, convinced that the open area was mined, refused to land in the vicinity of the wounded Marines and instead put down at a distance. Major Ram and Captain Ford exited the helicopter and began to cross the open area toward the wounded men. The pilot was right – the area was mined, and both Major Ram and Captain Ford died as a result. At least one of the two wounded Marines survived; he visited the Ram family several years later and described the circumstances. 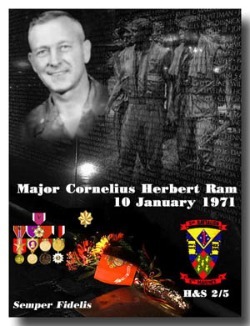 Corky Ram was one of 13,085 Marines who died in hostile action in Viet Nam. I knew others, but he was the one I knew best. More than once, I have stood gazing at his name on the wall at the Viet Nam Memorial in Washington, DC. When Memorial Day comes around, he symbolizes for me the American service men and women who have died in the nation’s wars. What we and all of the free world owe them is beyond calculation. A worthy and touching story. There are men Like Major Ram, and we are blessed that we have them. They epitomize the courage and the dedication it takes to be a warrior leader. He was one, and I’ll bet it was a pleasure to call him friend. Thanks for sharing this. Thank you for sharing this memorial. I am a Vietnam vet and I appreciate your thoughts. Sharing this love for your friend reminds us all of love’s power and endurance. Thank you for this dedication. We can never see this tribute enough, as we need to remember those precious ones who gave their lives for the cause of freedom, whether for us or those suffering under brutal regimes elsewhere. Bless you, Doug for reminding us of your brave comrade. I served with Major Ram at 2/5 for three months , 7/70-9/70. I was a fighter pilot, serving as a Forward Air Controler with his battalion! I learned a lot from him and my little group of radio operators! Big change from 600 mile per hour bombing runs to fire fights in the jungle, but with leaders like Major Ram and Capt Day our Battalion was great! We all grew up ! Thanks Linda!